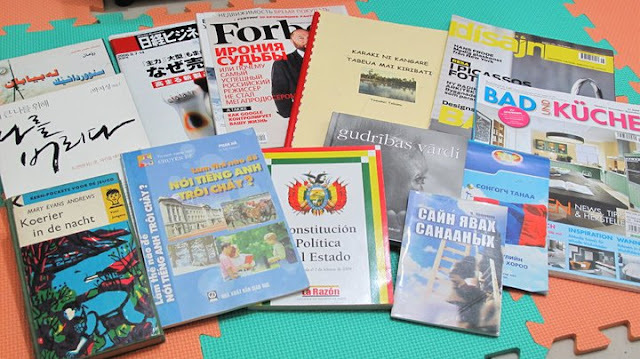 Apart from playing guitar, another hobby what I have is collecting foreign-language books. Does it sound interesting? I have 11 languages so far, besides English, Chinese, and Indonesian. I got some of the books by exchanging with friends and some are free. I am glad to have kind friends that helped me in collecting books. I am certainly looking forward to more books. Studying in the international program has let me experience the feeling of being in an international society, where students come from more than 60 countries around the world. The international program benefits me a lot in terms of language. I have learned that some countries in northern Africa have Arabic or French as the official language, there are 11 official languages in South Africa, and Afrikaans is similar to Dutch as Swazi to Zulu or Xhosa. I have also learned that people in Haiti speak Haitian Creole, which is similar to French as well as learning about Pidgins, Creole, languages of countries in the Pacific Ocean, and many more things that are interesting. I hope that everything will be better in this New Year. "歐趴" or "All Pass" to all my classmates in the final exam next week. Happy New Year Selamat Tahun Baru !!! 新年快樂 !!! 新年快乐 !!! sen lin fai lo !!! laimīgu Jauno gadu !!! 새해 복 많이 받으세요 !!! unyaka lomusha lomuhle !!! Your language is not on the list? That's because I don't know how to say it. :D How do you say "Happy New Year" in your language? And what is the next language you will learn? Thanks for reading this article. Share it with your friends if you like. If you have opinions, please leave a comment or send me a private message. Remember to subscribe to this blog to be the first one to get new updates.